Welcome to the College of Agriculture, Health and Natural Resources! Our goal is to help students identify an appropriate major and realize their educational aspirations. While the University of Connecticut is a relatively large institution, we pride ourselves on the “small college feel” that we facilitate by making students our number one priority. Students in the College of Agriculture, Health and Natural Resources will have a faculty advisor starting in the first semester. During Orientation we talk to students about their educational and career goals. Based on this information, we can assign a faculty advisor in the major who best matches the student’s individual interests and goals. Students work closely with their faculty advisors regarding their course selection, graduation requirements, and career goals. The Office of Academic Programs provides additional information and support for advising to both students and faculty in the College of Agriculture, Health and Natural Resources. Students and faculty may also contact us with questions about general education requirements, university-wide policies and procedures, or the application of transfer credits. At Orientation, CAHNR students will learn about the College’s academic policies, procedures, and requirements as a group from advisors in Academic Programs. 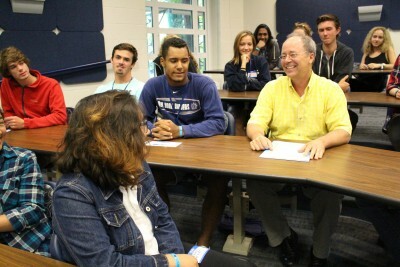 Students will also meet in small groups with a faculty advisor from their specific department. The faculty advisor and Academic Programs staff will help the student select an appropriate schedule of classes for registration. Please explore the sub-pages to find out what students should do before attending Orientation (Pre-Orientation Checklist page), Transferring Credit, Advising Tips for Success at UConn, and Orientation Frequently Asked Questions.